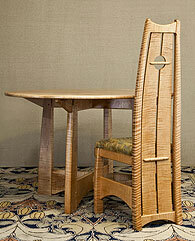 by Lynn Barrett, Primetime Concepts, Inc.
Windham County is rich with artistic vision, talent, and craftsmanship. It boasts five popular craft and artisan open-studio tours spaced at different times of the year. The granddaddy is the Putney Craft Tour, which will celebrate its 40th anniversary on Thanksgiving weekend. It's the oldest continuing crafts tour in the country and has served as a prototype for tours that followed. It has been named a Top Ten Vermont Winter Event by the Vermont Chamber and is an Arts 2018 event being promoted by the Vermont Arts Council. Several founding members of the tour will open their studios again this year, as will as some new tour members. Founder and potter KEN PICK arrived in Putney in 1969 after receiving an MAT from Antioch-Putney Graduate School. But pottery was never far away from his heart, and in about 1973, he began to earn a living from his craft. "There are still five or six of us here who were here from the beginning," Pick said. "We banded together in one location before we evolved the tour concept. It got more sophisticated as time went on." This year there are 25 artists on the tour, which includes two guest artisans—the husband and wife team of MARCIE and PETER MAYNARD. Marcie is a painter and Peter a fine furniture maker. In addition, photographer PAMELA SIMMONS has joined the tour. "It's never been more than 28," says Pick. "There was a conceptual agreement that this size was good. We wanted to bring in new young people who arrived in the area." He adds that the date of the Thanksgiving weekend was chosen carefully: "It's the start of the gift-buying season. And, because it's Thanksgiving, there are a lot of people visiting family from all over the country and around New England. Most tour visitors are actually non-Vermonters. They come from New Hampshire, Massachusetts, Connecticut, New Jersey, New York, and even from overseas." Connections are what it's all about, both for the artists and the people who visit their studios. Thousands of visitors move through over the course of three days and engage with the artists, the real draw of such tours, as well as the distinctive, original pieces for sale. People say it's much more interesting and exciting to see something in a studio where it was created and to speak to the artist who made it than to see a piece in a shop or gallery. 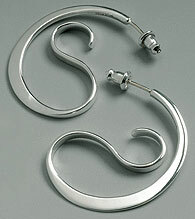 Silver jeweler JEANNE BENNETT, who has been on the tour for over 15 years, appreciates the feedback she gets. "It's nice to get the work out in public. I'm up in the woods, and I love hearing everyone's feedback." In addition to first-timers, Bennett, like most of the artists, has repeat customers who come back "to see what's new and add to their collection." 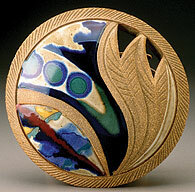 Potter DAVID MISCHKE also loves the interaction with customers. "It's wonderful to meet people, explain how you make the pottery. They learn that it requires more skill and experience to make a living than they realized. Mischke says that 500-700 people usually come each day to see and buy his functional stoneware pottery, which is distinguished by beige/brown exteriors and bright blue Chung glaze interiors. More than anything, the tour is great entertainment. Driving the back roads and finding the studios is an adventure in itself, although the studios are well marked and maps provide clear directions. Erica Noyes from Massachusetts says, "I have been coming on the tour since I was in high school. (I graduated in 1994.) I grew up in Maine but have family in Vermont, so that is how I started attending. I went to Bennington College, so it was easy for me to do the tour those years. I live in Boston now but try to make it up every year with my husband. I tell everyone that it is the best event of the year!" The tour is also an inspiration for those who may be interested in working with their hands. 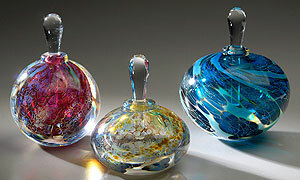 One family's story of finding the Putney Crafts Tour: "My youngest son Shawn became very interested in glass making. A colleague at work mentioned glass blowers on the Putney Tour, so we packed the family in the car and headed up from Massachusetts the day after Thanksgiving 15 years ago. We visited BOB BURCH's studio, and Shawn was hooked. He went on to study glass making at Alfred's School of Art & Design, and we have returned to the Putney Craft Tour nearly every year since then," says his mother Aggie Baker, who's also an artist. Putney also reflects the power of the creative economy. "It's not just the crafts studios who benefit, but area B&Bs, stores, restaurants, and retailers," Pick says. "Local shop owners say it's their biggest weekend because of the tour. In fact, for the last four years we've been partnering with other cultural entities in Putney including SANDGLASS THEATRE and NEXT STAGE ARTS to put on special performances during the tour. We also tie in with local restaurants to offer Putney Craft Tour specials. We're promoting it as Putney Craft Tour's Craft, Culinary and Performance Weekend. People love it." The tour includes wine and cheese tastings as well as demos. Visitors may start at The Gleanery Restaurant, 133 Main St., Putney, for info, maps, and a preview exhibition of the artisans' work. 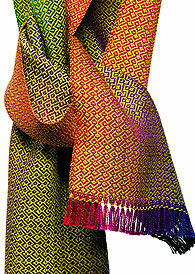 Visit online at www.putneycrafts.com.